After watching hundreds of photos from friends on social media over the weekend celebrating St. Patrick’s Day I had to wonder if they know anything about St. Patrick. There were parties all about green and drinking. Lots of drinking from the looks of it. And already lots of eating corned beef and cabbage. But is that what the Commemoration Day for this holy man is all about? Saint Patrick was born in Great Britain about the year 385. As a young man he was captured and sold as a slave in Ireland where he had to tend sheep. having escaped from slavery he chose to enter the priesthood, and later, as a bishop, he tirelessly preached the Gospel to the people of Ireland where he converted many to the faith and established the Church. He died in Down in 461. I don’t know if he ever had a green beer but I could see him enjoying one. His sounds like the kind of spirit that found joy even in suffering and trial. I ask for his prayers as we celebrate him tomorrow! Chelsea pointed me to the Saint’s Name Generator created by Jennifer Fulwiler. If you don’t have a patron saint or would like to find a new one for the year then give it a try. 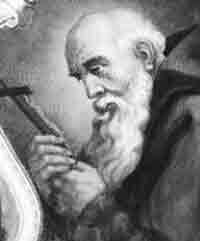 I did and found St. Conrad of Piacenza. He is a patron saint against hernias. This seemed appropriate in light of the fact that we’re planning to move back to Florida this year and I’m betting there will be some heavy lifting. If you don’t have a patron saint or haven’t ever studied the lives of saints I highly recommend it. Saints are part of the rich history of our Church and can not only be an inspiration but extremely helpful if you ask for their prayers. I feel very blessed to have a number of patron saints that include St. Charles Borromeo, St. Albert the Great, St. Francis of Assisi, St. Josemaria Escriva and others. Now I have St. Conrad of Piacenza too! Today would normally be the feast day of St. Francis of Assisi, my confirmation saint. But it’s a Sunday, the 27th Sunday of Ordinary Time to be precise. 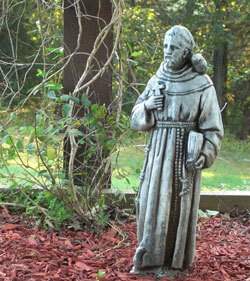 This is my statue of St. Francis that watches over my house and yard. So today I ask him to pray for me and my family and everyone. You probably know that he’s the patron saint of, animals, Catholic Action, environment, merchants, Meycauayan, Italy, Brgy. San Francisco, San Pablo City, Philippines and stowaways. That’s according to Wikipedia. You can also read more about him here. 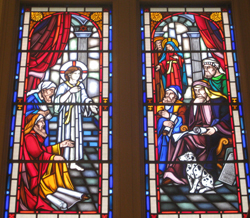 Today is the feast day of St. Dominic and on a visit to Portland, Oregon this week I learned something about Dominicans that I never knew – they have a thing for Dalmatians. The Holy Rosary Church in Portland features stained-glass window depictions of the mysteries of the Rosary, which is pretty common. What was different about these is that they each had a little Dalmatian worked into the scene. It made me go and look up the connection. According to the Mythology of Dogs by Loretta Hausman, the association of the Dalmatian and the Dominicans originates from a dream that St. Dominic’s mother had in which she saw a dog holding a flaming torch in its mouth, guiding her son to set a fire of truth to the world. Jesus deigned to teach me this mystery. He set before me the book of nature; I understood how all the flowers He has created are beautiful, how the splendor of the rose and the whiteness of the Lily do not take away the perfume of the little violet or the delightful simplicity of the daisy. I understood that if all flowers wanted to be roses, nature would lose her springtime beauty, and the fields would no longer be decked out with little wild flowers. And so it is in the world of souls, Jesus’ garden. he willed to create great souls comparable to Lilies and roses, but He has created smaller ones and these must be content to be daisies or violets destined to give joy to God’s glances when He looks down at His feet. Perfection consists in doing His will, in being what He wills us to be. 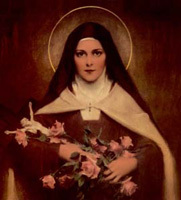 I understood, too, that Our Lord’s love is revealed as perfectly in the most simple soul who resists His grace in nothing as in the most excellent soul; in fact, since the nature of love is to humble oneself, if all souls resembled those of the holy Doctors who illumined the Church with the clarity of their teachings, it seems God would not descend so low when coming to their heart. But He created the child who knows only how to make his feeble cries heard; He has created the poor savage who has nothing but the natural law to guide him. It is to their hearts that God deigns to lower Himself. These are the wild flowers whose simplicity attracts Him. When coming down in this way, God manifests His infinite grandeur. Just as the sun shines simultaneously on the tall cedars and on each little flower as though it were alone on the earth, so Our Lord is occupied particularly with each soul as though there were no others like it. And just as in nature all the seasons are arranged in such a way as to make the humblest daisy bloom on a set day, in the same way, everything works out for the good of each soul. Not only did Christ tell us to enter the Kingdom of heaven as little children, he showed us the way by litterally becoming a little child himself – even an infant in the womb, completely dependent on His mother for everything. I look upon myself as a weak little bird, with only a light down as covering. I am not an eagle, but I have only an eagleâ€™s EYES AND HEART. In spite of my extreme littleness I still dare to gaze upon the Diving Sun, the Sun of Love, and my heart feels within it all the aspirations of an Eagle. The little bird wills to fly toward the bright Sun that attracts its eye, imitating its brothers, the eagles, whom it sees climbing up toward the Divine Furnace of the Holy Trinity. But alas! the only thing it can do is raise its little wings; to fly is not within its little power! Jesus, I am too little to perform great actions, and my own folly is this: to trust that Your Love will accept me as a victim. My folly consists in begging the eagles, my brothers, to obtain for me the favor of flying toward the Sun of Love with the Divine Eagleâ€™s own wings!